If you’re arrested for any crime, there are several things you need to know to protect yourself. Though not necessarily required in every case, Police officers may at some point read you your rights prior to or upon arrest. Your rights include remaining silent, so exercise that right until you can speak to an attorney. As soon as a police officer reads the Miranda warning to you, be aware that anything you say can become part of the prosecution’s evidence in court. In some cases, you might be able to give your criminal defense attorney information that can help exonerate you. While the police search your property, pay careful attention to any evidence they collect. Let your attorney know about it as soon as you meet with him or her. You might not have the chance to speak with a criminal defense attorney before you’re arraigned in criminal court. An arraignment gives you a chance to tell the court whether you plead guilty or not guilty. Never plead guilty at this time. Instead, plead not guilty and wait until you can consult a lawyer. Even if you eventually plead guilty to the charges, an experienced attorney can negotiate a plea bargain that might result in a reduced sentence. They may also be able to identify legal defenses that can result in some or all of your charges being dismissed. You’re always better served by waiting until you have legal counsel before you make any important decisions. While you should never lie to law enforcement, neither should you make any admissions that could get you in trouble. For instance, if the officer asks whether or not you’ve had anything to drink, you can simply decline to answer. Volunteering that you had “two beers” earlier in the evening could give the officer probable cause to proceed with further investigation. Remember that police officers can lie to you. They might tell you that they have evidence even if they don’t, hoping to trip you up and get you to admit to something criminal. Don’t allow yourself to engage in conversation. Simply ask whether or not you’re free to leave. Throughout the arrest process, remain completely cooperative. Do not struggle or argue with the police or give law enforcement any reason to add extra charges to your arrest. 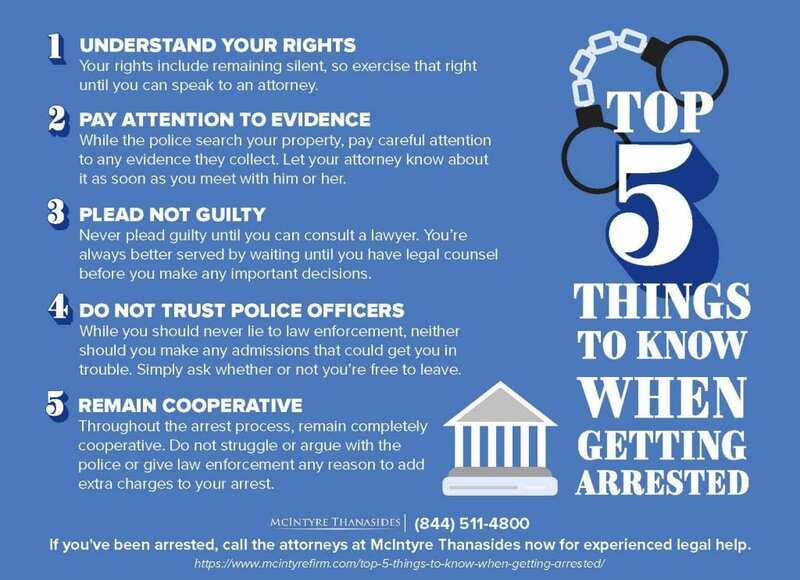 Once you’re arrested, such as for a DUI offense, contact McIntyre Thanasides at 844-511-4800 to discuss your case and to obtain legal advice. Working with a criminal defense attorney can drastically improve your chances of winning in court or getting a lighter sentence, regardless of the reason for your arrest.